Recallers 3.0 is “officially” over in that the lessons and webinars have all been delivered. However, the community is still wildly active inside. Many of the students are repeating the course all over again, as a group! Lynda O-H has been running a series of “Crate Games” challenges for everyone. Another amazing group of students (and staff) and I once again feel blessed for all the people that keep my life so interesting and full. Having reviewed a boatload of Crate Games video clips recently I have seen a common mechanical issue I would like to address. 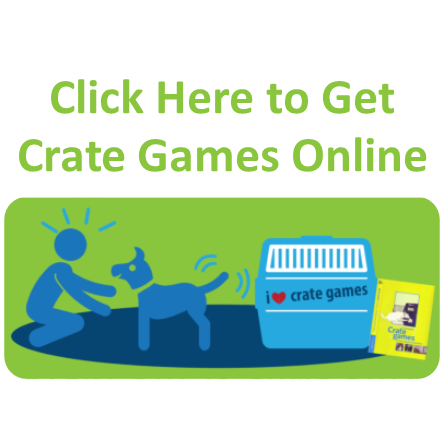 Crate Games is a fantastic way to introduce distractions into your training with your dog or a young puppy. Your dog should stay and if he doesn’t you simply close the door of the crate. No need to verbally or physically interfere with the dog; he makes his choices, you provide consequences for those choices. However, for some reason, people feel the need to stack these distractions one after another during their training, which I see as unbelievably deflating to the dog. In the photo at the top here, 15 Week old Swagger demonstrates his understanding, holding his “stay” while his favourite toy is thrown in front of him. The way I look at it, every challenge or distraction we throw at a dog in Crate Games is like asking the dog a question, in the past, I have referred to this as “Green Eggs and Ham” training (from the Dr. Seuss book of the same name). Although no words are spoken Swagger communicates his answer to me with clarity by his responses; his tail wagging, his nails turned out on all of his paws as he is showing great intensity, wanting his favourite toy but holding form to earn it. Swagger is a keen participate here, completely focused as he waits for me to evaluate the quality of his answer. I praise wildly, and either release him immediately to play with that favourite toy or I run back to deliver a cookie directly into his mouth as he sits holding position in his crate. If I feel his answer is not a quality one, I may choose to reset the session. I evaluate each answer Swagger gives me. If I don’t like his response I swiftly move in and close the door of the crate, if I do like his response, I reward the good choice. It is simply a conversation between friends. Imagine if you are having a conversation with your friend, they ask you a question and you give a brilliant answer, you are feeling kind of proud of yourself with your insightful answer! Immediately after you respond your friends says “Aaah, yeah but . . . “ and challenges you further on the subject. You are confused because you thought your first answer was pretty darn good, so you re-formulate your words and give your friend a new answer. Once again they immediately come back at you, pushing you more “Okay, sure but . . .” Doesn’t this start to feel a little antagonistic? Don’t you feel a little deflated and frustrated by your friend? 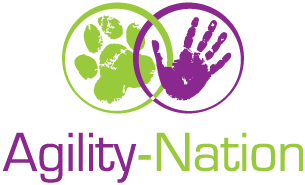 The dog expresses his answer by making the correct choice, narrowing his eyes and enthusiastically wags his tail awaiting the results of his good choice. Eventually, this dog loses the joy of this game. It is no longer a game to him, it is a one-sided conversation, more like an interrogation rather than a playful exchange. “Stays” become stressful, the dog worries. Distraction training is meant to be a playful banter back and forth between friends, not a one-sided cross-examination. It is meant to be fun for everyone. You ask a question, you evaluate the quality of the answer and you respond appropriately, laughing is recommended during this exchange because that is what friends do when they talk to each other. Please consider this the next time you want to work control behaviours with your dog. Training this way works, it really does work and is incredibly fun for all involved! Today I am grateful for the pure joy my dogs show during any control responses. 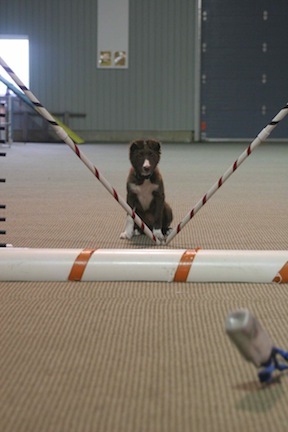 Regardless if it is an intense wait at the start line in agility or a relaxed out-of-sight stay in obedience; interactive communication starting with Crate Games has taught them the boundaries of the game and they are always happy to play along, abiding by the rules.